Find Me Where the Wild Things Are Leather Patch – A perfect accessory for your jean jacket, canvas bag, or… wherever you choose to put it! 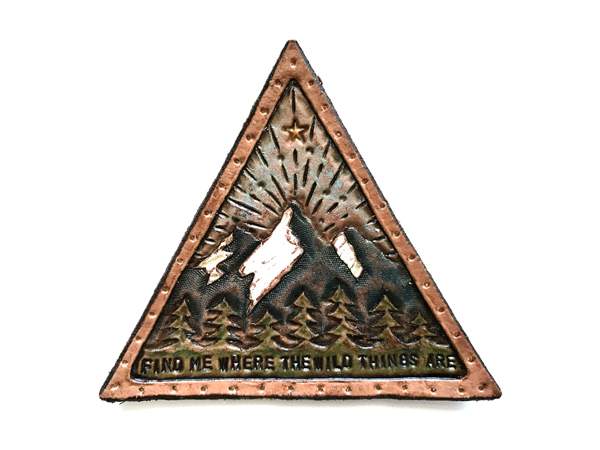 Find Me Where the Wild Things Are… These mountain/wilderness themed leather patches are hand carved one at a time from an original design, hand painted, punched and finished. Because of this each one differs slightly and can vary in depth of color making them all a one-of-a-kind. Colors may vary in depth from those pictured as they are hand painted one at a time. This triangle patch is approximately 3.5″ wide and 3″ tall.